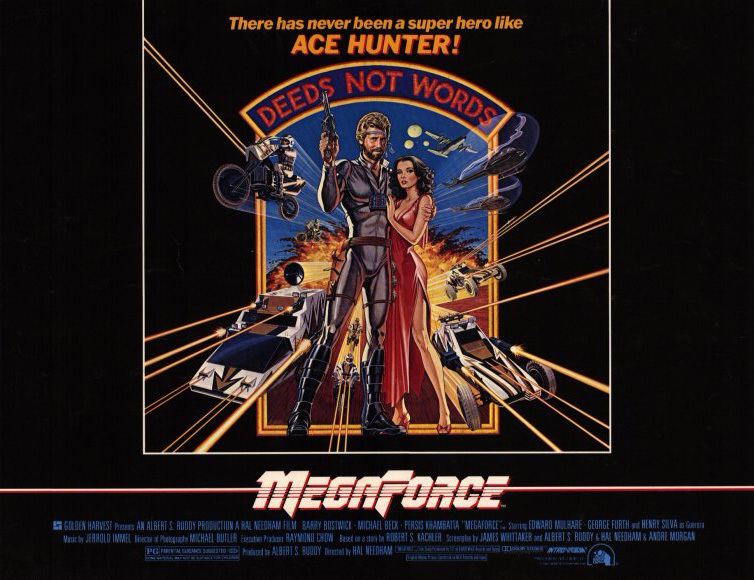 Not on DVD Clip Pick: MEGAFORCE (1982)! 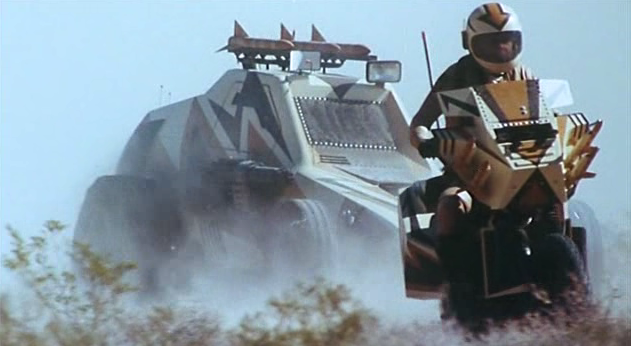 If one were to construct a guilty pleasure movie from scratch, you’d probably come pretty close to Megaforce. It has it all. Overblown central concept. Bad casting. Bad acting. Lots of stunts and explosion. Unintentional humor. Intentional humor that isn’t funny. And, most importantly, a we’re-making-a-hit attitude that suffuses every frame of this disasterpiece! Yup, it’s a very impressive thing. And as if that weren’t enough: It has Hal Needham (Cannonball Run) at the helm and stars Barry Bostwick (Rocky Horror Picture Show). This puppy oozes cult cred. But, sadly, this mega-cult classic isn’t on DVD. That’s why we’ve chosen it to inaugurate our new feature “Not On DVD Clip Pick”. And we chose a clip that displays Megaforce in all its glory. This clip has the action, the acting and the attitude that Megaforce fans love. Or to put it another way : It’s mega-fun, mega-fantastic … it’s Megaforce! Three and a half minutes of video you’ll want to watch over and over again.